Wednesday April 24th is both our monthly meeting and our annual meeting. We will be electing new officers for the guild year starting June 1, 2019 and voting on the budget for the coming guild year. All of the information is in our April Newsletter and in the Members Only section of the website. Come and learn and sign up for our exciting class offerings for next year. You may also want to renew your membership before heading north. Dues are due on June 1. 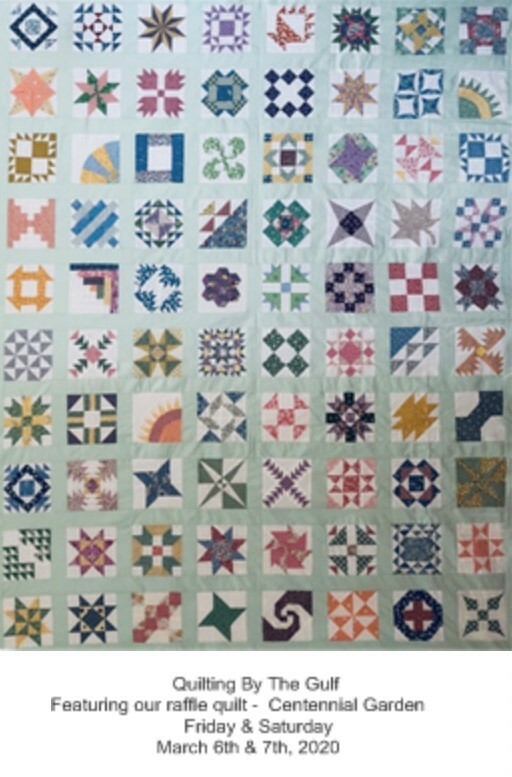 Raffle tickets for our 2020 show quilt are ready. If you haven't received your tickets, check with your Circle Representative or with Becky Adams. The doors open at 6:30 for socializing, business, library browsing and looking for fabric and notions treasures on the FREE table. The formal meeting starts at 7:00. Non-member guests are always welcome. There is a $5 guest fee to attend. May 9 - Informal Workshop at Jacaranda Trace. The group project will be making Stand Up Sewing Tool Holders for the boutique. You will want one too. members, and for class angels for our formal classes. Please check out the newly revised schedule of assignments. Informal workshops are now on Thursdays (not Wednesdays) starting April 11th and will continue at Jacaranda Trace. Visit the Informal page for more information. To see our schedule for the 2018 - 2019 guild year , CLICK HERE. To become a member, or to renew your membership, click here to download the form. Visit often to learn the latest Guild News.